First off, I apologize for taking a picture on a rainy day, but I was in the area and I had my camera on me so I thought I'd snap a picture. This is a 14.4kV single phase line in my hometown. The line stretches for about a mile or two, but this past snowstorm (10/29/11) really affected this line. It runs through a dense forest, and a lot of outages were caused by large branches and trees coming in contact with the line. So to combat this issue, my town is stringing a whole new conductor to replace the existing wire that is so prone to failure. The new conductor which is called "Tree Wire" has a special insulation on the outside and inside, that protects the wire from short circuits and arcing when it comes in contact with a branch or tree. In the picture, you can see one of the stringing blocks that will help pull the new conductor in. 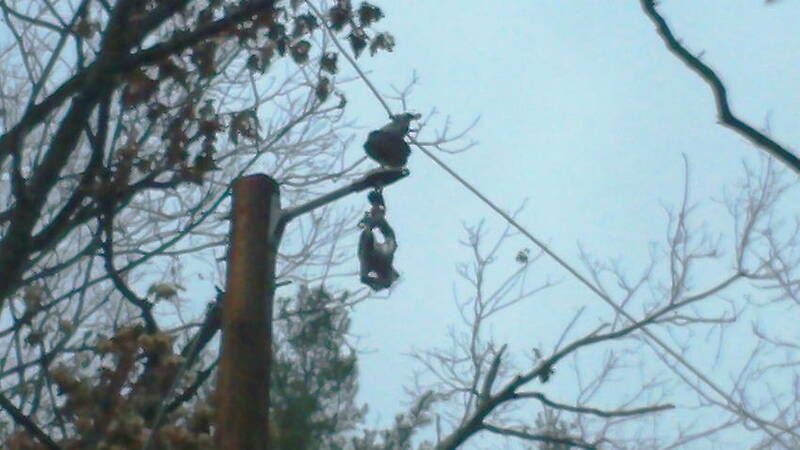 I believe the wire you see in the picture is 2/0 AL, and the new "Tree Wire" will be the same size. You can also see the polymer Hendrix Wire & Cable vise top type insulator. My town has been using these now for some time. I will post more pics as the line crew progresses and when there's a sunnier day.